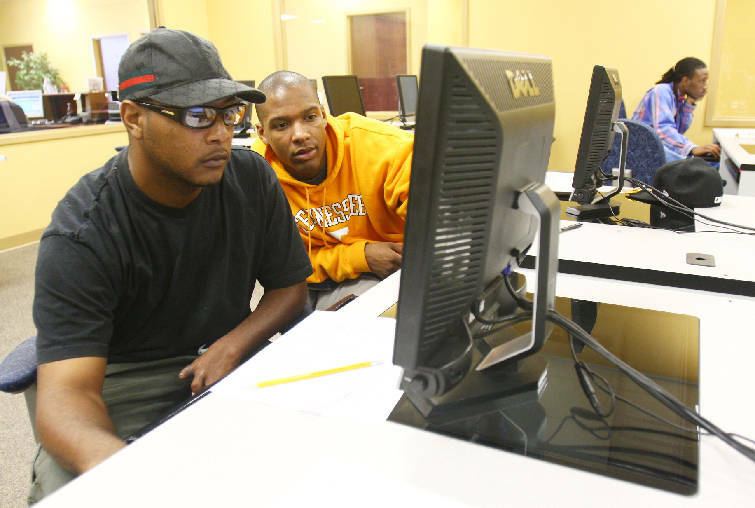 Timothy Goines, left, has help from Adrian Craighead while looking for jobs on the computer at the Tennessee Employment Service Office at Eastgate Center in Brainerd in this file photo. Unemployment rose in Tennessee and remained unchanged in Georgia last month as the sputtering recovery kept the jobless rate in both states above the U.S. average. The Tennessee Department of Labor and Workforce Development said the jobless rate in August rose for the fourth consecutive month, pushing the state's unemployment to 8.5 percent, or four tenths of a percent above the national average. "There's no doubt that there is a lull in the recovery," said Dr. David Penn, director of economic forecasting at Middle Tennessee State University. "We're seeing sales and construction growth level off and unemployment go up because of fewer people being hired while more people keep coming into the workforce." Employment in Tennessee dropped by 5,100 jobs from July to August but the state still added 24,600 net new jobs over the past year, according to labor department figures. Penn doesn't expect much change in the jobless rate for the rest of the year and pending budget cuts and tax increases if Congress doesn't adopt a budget could push unemployment higher again in 2013. "There is a lot of uncertainty about the fiscal cliff on the horizon," he said. In Georgia, unemployment was unchanged in August at 9.2 percent -- a full 1 percent above the U.S. average. The Georgia Department of Labor said the Peach State did add 25,100 jobs in August and 49,700 jobs over the past year. In August 2011, Georgia's jobless rate was 9.9 percent. But Georgia's jobless rate trended higher this summer, two years after economists determined the recession of 2008-2010 ended. "Georgia continues to have respectable job growth, which is a good sign," Georgia Labor Commissioner Mark Butler said in releasing the employment numbers Thursday. "While more than one-half of the monthly growth in August came from seasonal education workers returning to their jobs, what's more encouraging is the fact that the August-to-August growth in the last year is the most we've had since 2007."